The rain has stopped, but the chance for flooding hasn't. Many rivers and streams in the D.C. area still flooding, leading to a lot of headaches on the roadways for the Monday morning commute. Roads prone to flooding in many neighborhoods may be blocked until floodwaters recede. WASHINGTON — The rain is over but that doesn’t mean the risk of flooding has ended. Many rivers and streams are continuing to experience flooding, which is leading to a lot of traffic headaches. The biggest traffic headache is in Anne Arundel County, Maryland, where Md. 198 is closed between Bald Eagle Drive and Airfield Road is closed due to the roadway being washed away from flooding. Engineers will inspect the bridge with the hopes of fixing the roadway, but crews expect it could be weeks before the road is repaired. In Virginia, Stafford County Public Schools announced it is closed on Monday, June 4, due to impassable roads. White’s Ferry, which carries passengers from Loudoun County to Montgomery County, is closed Monday because of the flooding of the Potomac River. The National Weather Service issued a coastal flood advisory in effect for the city of Alexandria, Falls Church in Virginia, until June 5 at 5 p.m. In D.C., a coastal flood advisory expired at 12 p.m. Monday although a coastal flood warning is in effect until June 6 at 8 a.m. There are also a number of warnings and watches in effect for rivers and streams in the D.C. area. In Maryland, the biggest traffic headache is in Laurel on Md. 198 just east of the Baltimore Washington Parkway. The road is closed between Bald Eagle Drive and Airfield Drive due to flooding. Anne Arundel County police said the Maryland State Highway Administration is en route to the scene. Drivers in Montgomery County will find flooded roads in Chevy Chase, Bethesda, Silver Spring and Kensington. Beach Drive is closed several locations due to the flooding, including at Md. 410. In Prince George’s County, Water Street is closed in downtown Upper Marlboro between Md. 4 and Judges Drive. Roads in Hyattsville, Largo and Beltsville have also experienced flooding. In Anne Arundel County, roads near the area of Md. 450 between St. Stephens Church Road and Huntwood Drive were blocked due to flooding. Crews told WTOP’s Melissa Howell it could be weeks before the road is repaired. Police in Anne Arundel County also said to expect heavier traffic than normal around Arundel High School on Route 175 because of a tree that fell across the entrance of the school. Charles County also saw several road closures due to flooding. Most have reopened. You can find a complete list of road closures on the county’s website. In Virginia, the 6700 block of Springfield Drive in Lorton is closed because of downed trees in Fairfax County. In Stafford County, the Bells Hill and Holly Corner Roads have been declared impassable. The recommendation from VDOT and the Stafford County Sheriff’s Office is to not allow any heavy equipment on these two roads for fear of collapse. 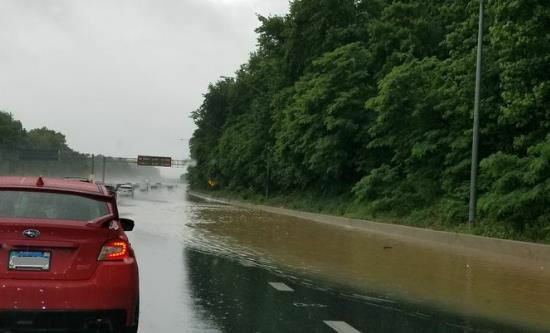 The Prince George’s County Fire Department conducted multiple water rescues Sunday, as unrelenting rain flooded roads and trapped people in their vehicles. MARC said that it plans to operate full Brunswick Line service on Monday, as there are no infrastructure problems due to the heavy rains. However, continued heavy rains and the rising Potomac River may cause problems, which may cause service disruptions. MARC plans full service on the Penn Line between New Carrollton and D.C., barring any changes due to weather. For the latest service schedule, go to MARC’s website. In Poolesville, Maryland, White’s Ferry is closed until further notice due to high water on the Potomac River. Stafford County Public Schools announced they were closed on Monday June 4 due to impassable roads. Employees are on Code 2 with liberal leave in effect. Offices open at 10 a.m.
You can find the complete list at WTOP’s Closings and Delay’s page. The National Weather Service has extended a flood warning for Anne Arundel, Calvert and Prince George’s counties in Maryland until 6 p.m. The weather service said the stream gauges indicate flooding is occurring on Western Branch and other waterways in the Upper Marlboro area of Maryland. While the streams are receding, the waters will remain out of their banks and flooding is expected in nearby areas through the afternoon areas. There are also a number of flood watches and warnings for rivers and streams in the D.C. area. There are two flood warnings along the Potomac River at Little Falls and Edward’s Ferry. At Edward’s Ferry, the warnings affect Montgomery County, Maryland and Loudoun County, Virginia. As of 5:45 a.m. Monday, the Potomac was at 17.67 feet, which is well above flood stage at 15 feet. The National Weather Service said the river is expected to reach 22.4 feet at some point on Monday, which would be slightly less than a major flood. At that level, the National Weather Service said water can reach the first floor ceiling at Whites Ferry store. Significant portions of the C&O Canal towpath are already flood and backwater flooding is affecting homes on the Virginia side of the river in Loudoun County near Broad Run in Sterling. The weather service expects to the river to fall below flood stage by Wednesday morning. At Little Falls, the flood warning effects Montgomery County, Maryland, and Fairfax and Loudoun counties in Virginia. While the Potomac at Little Falls was slightly below flood stage as of 5 a.m. Monday, the weather service expects the river to rise to flood stage by Monday afternoon and crest at 13 feet on Monday night. Should the river reach 14 feet, significant portions of the C&O Canal towpath would be flooded, the Blockhouse Point Park would be flooded and water would reach the retaining wall at Overlook 1 at Great Falls National Park but would not overtop it. The river is expected to drop below flood stage by early Wednesday morning. The National Weather Service has also extended a flood warning on the Rappahannock River at Fredericksburg, Virginia, until late Monday night. The river is currently at flood stage at 13 feet. Should the river reach 15 feet, Old Mill Park in Federicksburg would no longer be accessible by car due to flooding. Just outside of the D.C. area there is a flood warning on the Potomac River at Williamsport, near Hagerstown, Maryland. As of 6 a.m., the weather service reported the river was already one foot above flodo stage with minor flooding occurring and moderate flooding forecast. The river is at 24.1 feet, at 25 feet, structures will begin to flood at the Potomac Fish and Game Club. Storm Team4 meteorologist Matt Ritter forecasts nicer weather for Monday, with clearer skies later in the day. High temperatures will range from the upper 70s into the low 80s. Wednesday may be the most pleasant day of the next three. The National Weather Service said rainfall amounts of one-half inch to 1.5 inches of ran can be expected through 6 a.m. Monday, though the rainfall is not expected to be intense. A partly cloudy day is expected on Monday with a chance a rain, but not a wash out. Pleasant temperatures will hover in the low to mid 70s. Partly sunny with a chance for rain, highs are expected to be in the low 80s. Sunday afternoon brought steady rain once again into the Washington, D.C. area. Many reports came in of rivers getting close to flood stage, along with flood watches and warnings for most of the area.